The last pass on the John Muir Trail is Forester Pass. At 13,153 feet above sea level, it is the highest pass on the John Muir Trail* (and the highest point on the JMT’s much longer sibling, the Pacific Crest Trail). For many who hike southbound, it will also be the fourth pass in four days. The trail up and over the pass was one of the last portions of the trail completed. Much of it is carved into granite, with–if not hair-raising–at least significant exposure to falls. The only way to hike the last few miles of the approach in the shade is to hike it at night (or carry an umbrella). There isn’t a tree to be found. As John Muir Trail passes go, this is the top dog! Actually, it’s not that tough. Physically, by the time to start your way up to Forester Pass, you will have developed legs of steel. With more than 180 trail miles behind you, as well as seven other passes, walking uphill just isn’t going to wear you out like it once did. Psychologically, there will be very little left on the trail to intimidate you. The butterflies, which were doing loop-de-loops in your stomach as you stood in front of the trailhead sign in Happy Isles, have been exterminated long ago. Besides, as I’ve mentioned previously, once you’ve cleared Glen Pass (probably the day before), your frame-of-mind has subtly changed: you are no longer hiking the trail, you are finishing the trail. The other factor in your favor is the way the trail is built. It’s miraculous, really. The grade is relentless, but it is also moderate and consistent. There are no possible navigation problems to contend with (unless the area is covered with snow). Keep moving and keep admiring the gorgeous scenery and you’ll be at the top of the pass before you know it. The view from near Forester Pass is remarkable, as is the exposure! When you arrive you’ll quickly realize that you will have reached somewhere special. If you were to straddle this pass in a rainstorm, drops that fell to your north would ultimately find themselves in the Kings River. The precipitation to the south will run downhill to the Kern River. One foot will be in King’s Canyon National Park, and one in Sequoia National Park. The perfect geometry of Junction Peak, with a summit less than a mile away and just a little more than 700 feet above the pass, looks impossibly symmetrical–almost sculpted. To the south you’ll see Diamond Mesa (looking, unsurprisingly, narrow at the close and far end, and wide in the middle), and Tyndall Creek, your constant companion for the trip down. It’s not all downhill from Forester Pass to the end of the JMT; you will climb even higher before you finish at the summit of Mount Whitney. But, as you depart Forester Pass, one of the last great challenges of the trail will be behind you and in two days it will likely all be over. * Once you leave the John Muir Trail for the trip down to Whitney Portal, you’ll cross another, slightly higher, pass: Trail Crest. However, the less-than-a-mile stretch from the point at which you leave the JMT, to Trail Crest pass, involves very little climbing. A few months ago I wrote a blog describing what surprised me most about thru-hiking the John Muir Trail. After reflecting a bit, I realized that I left out what was probably the most surprising aspect of the hike of all: how easy it was. Now, don’t misunderstand me; the hike as a complete experience was NOT easy. There was getting the time off, getting myself in shape, getting my supplies to the right place at the right time, and arranging accommodations. Some days on the trail were tough, either because of the mileage I wanted to make that day, or because of my own stupidity regarding drinking and eating. What I mean when I say the trail was surprisingly easy is that I rarely felt I was working at the edge of my capabilities as I walked. On the eight major passes—even on the climb to Mount Whitney—I almost always felt like I had a bit of a reserve that I could have drawn upon. Almost always. The exception was Glen Pass. Take a look at the profile, below, of the trail. Glen Pass is the section within the circle. Does it look a bit steeper than just about anywhere else on the trail? It is. 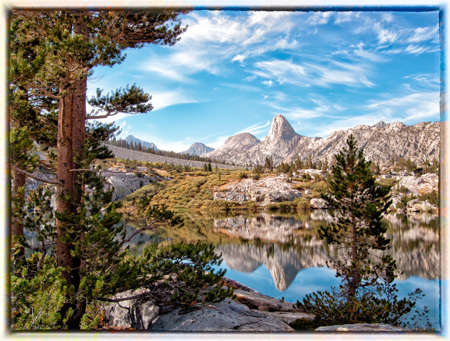 The other reason I’m shooting for the Rae Lakes area as a campground is because it will mean less of a climb on the day I hike over Glen Pass. The pass, by the way, was once known as “Blue Flower Pass.” It was renamed, in 1905, for Glen H. Crow, a US Forest Service Ranger. If you look at an old (prior to 1927) map, you’ll see the name spelled “Glenn”, but the proper spelling has just one “n”. On the day you climb Glen Pass, be prepared. It’s eminently doable, but it’s not easy! Imagine for a moment that you had the opportunity to walk the John Muir Trail with the great man himself. What conversations you might have, although it’s hard to predict what his reaction to the trail might be—after all, he is a man of the nineteenth, not the twenty-first, century. He had a different set of sensibilities. My own personal opinion is that he would find the ease of navigation—the fact that you can hike almost the whole 211 miles without a map—to be a bit off-putting. He wanted the common man to get out into the woods, but come on. Generally, though, I’d like to think he would be pretty happy walking through his beloved Range of Light and the way we’ve conserved it. He might even get a kick out of seeing a hut (named for him) at the top of a pass (named for him) along a trail (named for him). Or perhaps he’d think we went a bit overboard. I can even imagine the two of you hiking over Mather Pass. Then you would get to Pinchot Pass, and a puzzled look would appear. 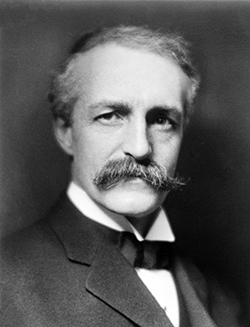 Gifford Pinchot was the first Director of the United States Forest Service. His family had grown rich through the timber and lumber business, and he brought a businessman’s sensibility to the running of the USFS. That might make you assume that he was in the pocket of the timber companies of the time. In fact, the opposite was true: he spent most of his time fighting their short-sightedness. 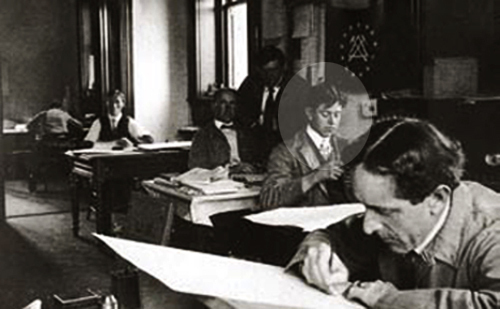 Pinchot was Yale educated and a former Dean of the New York State College of Forestry at Cornell University. He knew his trees, and he knew that the best way to assure the future of timber harvesting was through conservation and proper management. He was a member of the Progressive Party, and was considered a rabid environmentalist in his time, if they had used that term. But he still fell short of John Muir’s philosophy. You’ll find no poetic reference to the forests in Pinchot’s writing, nor any appeal to the spiritual rewards of watching alpenglow filter through the branches of a stand of pines. Pinchot saw wilderness as a commodity—one that required careful stewardship—but a commodity nonetheless. Muir’s opposition to using wild lands in pursuit of commercial gain made Pinchot an enemy. When Pinchot came out in support of the Hetch Hetchy reservoir, in the middle of Yosemite National Park, that was the final straw. What made matters worse was Pinchot’s deft handling of the media. He was a master at getting favorable articles into the magazines and newspapers of the time. When it came to Hetch Hetchy, Pinchot won the argument (at least so far; there is a move afoot to drain and restore that valley). Muir would never forgive him. The name of the pass was probably transferred from the nearby Pinchot Peak, named by J. N. LeConte in July of 1902. Climbing the pass, if you are hiking southbound, is a breeze, because you will have camped not that far below it the night before (at least if you went over Muir Pass the day before). You’ll probably only have to climb around 2,000 feet. The descent isn’t as steep as some and you should be able to make good time. My recommendation is to get as far as you can, comfortably, because the next day is Glen Pass, the toughest on the trail. Pinchot believed that Ballinger was using his position as Secretary of the Interior to further his own personal financial interests, and to grind the conservation movement to a halt. (The consensus is that the first accusation was false, the second, true.) Pinchot accused Ballinger of as much, publicly, and demanded that Taft investigate. Taft did just that, through his attorney general, and cleared Ballinger of any wrongdoing. That displeased Pinchot, who sent an open letter to a congressional ally who read it into the record. Part of the letter cast aspersions on the integrity of Taft. Pinchot was fired, and the firing was the first shot fired in a battle that would eventually split the Republican Party between Taft and Teddy Roosevelt (running as the “Bull Moose” candidate). Combined, they got over 50% of the vote, but neither got enough votes to prevent Wilson from backing into the presidency. Wilson, a Klu Klux Klan apologist who thought that the movie “The Birth of a Nation” was a great choice to be the first movie ever shown at The White House, went on to such “achievements” as the Sedition Act of 1918 (which could get you tossed in jail for criticizing the government) and a constitutional amendment to allow an income tax. Poor Pinchot; all he wanted to do was save the forests. As we march, southbound, through the named passes, we now reach the first real giant: Stephen Tyng Mather (1867 – 1930). Mather began his working life, after graduating from the University of California at Berkeley, as a reporter for the New York Sun. Later, he worked for the same company in which his father held a senior position: the Pacific Coast Borax Company. Within two years Congress had approved the establishment of the National Park Service, and Mather had become its first director. Your trip to the top of Mather Pass, if you hike southbound, will likely begin with a triumph over one of the more infamous sets of switchbacks on the entire John Muir Trail: the Golden Staircase. This portion of the trail was the last to be built, by specially trained crews from the Inyo, Sierra, and Sequoia National Forests. The results are impressive, intimidating, but infinitely doable if you just keep at it (especially of you hit this stretch early in the morning). Mather Pass itself is unique among the major passes you encounter southbound because you can actually see the pass well in advance—miles in advance, actually. Personally, I didn’t find that to be an advantage, but you might. From the top you realize just what a monumental wall of rock you’ve been climbing. Although there is no significant exposure on the trail, the view from the pass of the rubble-strewn ridgeline through which you are passing is quite a spectacle. Thus far I have described how Donahue, Silver and Selden passes all got their names. I don’t suppose there is much mystery regarding who Muir Pass is named for. Who gave the pass that name, however, is a little less well known. A route suitable for man and stock, extending from Yosemite to Kings Canyon, was a dream long before the current John Muir Trail existed. Portions were already established by the Sierra Club and the United States Geological Survey in the early 1900s, but it wasn’t until 1907 that the last segment was mapped and proven passable. That last section of the route was the stretch between the Evolution Basin and the Middle Fork of the Kings River. George R. Davis, of the USGS, led the team that first reconnoitered and later traveled the route. In 1907, he named the pass which separates the Evolution Basin and the Middle Fork of the Kings River as Muir Pass. Muir Pass is probably best known for having the famous Muir Hut, which was built in 1930 by the Sierra Club and acts as a temporary shelter for those exposed to storms. The pass is at nearly 12,000 feet of elevation, so during my thru-hike this was one of the last places I expected to have a wildlife encounter, but I did! I was sitting on the steps of the hut, eating an energy bar, when a doe and fawn walked right by me, heading west. (The trail actually runs east-west at that point.) They paid little attention to me, looked as if they were not exerting themselves much at all, and headed down towards Wanda Lake. 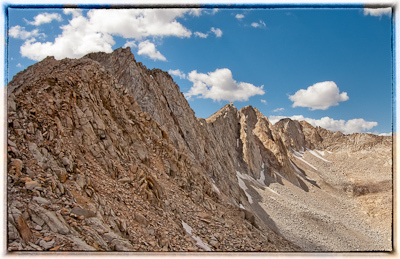 Selden Pass is the third major pass one encounters when hiking southbound on the John Muir Trail. It’s also the lowest of the major passes, at just 10,800 feet. What it lacks in elevation it makes up in beauty. Of all the passes on the John Muir Trail, loiter around this one the most. The first gem in the area is Marie Lake, just a mile north. 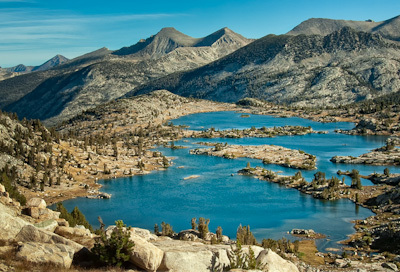 If one were to survey JMT thru-hikers as to the most beautiful spot on the entire trail, Marie Lake would at least get an honorable mention. Several peninsulas jut their way into the pristine water, and there is an arrowhead-shaped island in the middle. Stunted pines (the elevation here is over 10,500 feet) and polished granite complete the picture. 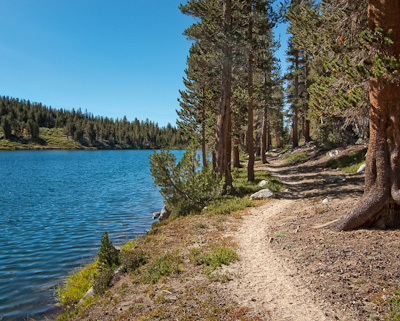 If you are intending on stopping at Muir Trail Ranch, there are only about nine trail miles left once you pass Marie Lake, and about eight of those are downhill. That means that there is plenty of time to explore. If you’ve camped in Rosemarie meadow the night before, you should be hitting this spot at about “second-breakfast” time. Find a good spot and enjoy. The next time I’m there I’m determined to swim out to the island—regardless of the temperature of the water. The view from the top of the pass, in both directions, is among the best of the trail. To the north is Marie Lake, and to the south Heart Lake and the Sallie Keyes Lakes. All of them are easy on the eyes, especially since they are low enough to be surrounded with some trees. Moving south, past Heart Lake, you reach one of my favorite spots on the John Muir Trail: the isthmus separating the two Sallie Keyes Lakes. The trail borders the western edge of the southeastern of the two lakes, but the entire isthmus is wooded with good views in all directions. The shade, views, and pine needles over soft dirt make it a perfect spot for a break, and perhaps even a nap! During my thru-hike I was shocked to see the first day hikers since Tuolumne Meadows here at Sallie Keyes. They had walked up from Muir Trail Ranch. Those who know the area know that Mount Hooper is close by. You might guess that it is named for Selden Hooper. Not true! Mount Hooper is actually named for Selden’s father. Keeping things in the family, Rose Lake, nearby, is named for Rosa Hooper, Selden’s sister. 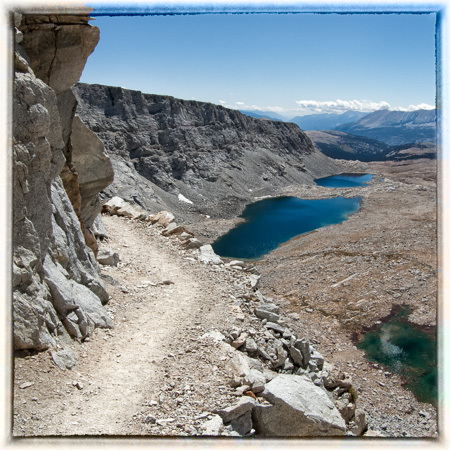 There are eight major passes on the John Muir Trail. Each has its own character and beauty, and each is named for an individual associated with the Sierra Nevada. The first you encounter, if you hike southbound, is Donohue Pass. You’ll likely reach Donohue Pass on the third, fourth or fifth day, if you begin at Happy Isles. The pass is about thirty-seven miles from the northern trailhead, and is just tough enough to give you a confidence boost, while at the same time easing you into this whole “pass-climbing” routine. The sense of accomplishment comes from a couple of geographical coincidences: first, at the top of Donohue you leave Yosemite National Park—after starting in the valley you will have walked all the way out. Second, on the way up you have some fabulous views of Lyell Canyon. For the first time during the hike you’ll get a sense of how FAR you’re walking, as it appears on the ground. It’s pretty impressive, particularly to those who are new to backpacking. On the other hand, the fourteen miles prior to beginning your ascent will be on downhill or relatively flat terrain. There are also good camping areas at the very beginning of the climb, so you can spend the night before in one of them and tackle the ascent in the cool morning air, with fresh legs. Last, it’s among the least steep of the climbs-to-passes that you’ll encounter. Lieutenant N. F. McClure, of the 5th U.S. Cavalry (a unit that still serves today) named Donohue Pass after a sergeant in his unit. There is little known about Sergeant Donohue, but Lieutenant McClure’s fame (and terrain features named by him) stretch throughout the Sierra Nevada. One last recommendation: about a third of the way up there is a gorgeous mountain tarn with a single shade tree under which a long break is almost mandatory. 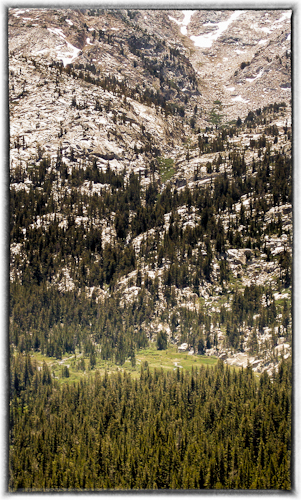 It a great place to top off your water and to take in your first view of the Sierra Nevada at or above tree line. Once you’re done, cross the outlet stream from that very same tarn to be on your way.